Konigsberg, a fortified city of Prussia, capital of an administrative district and circle of the same name, in the province of East Prussia, on the river Pregel, about 5 m. from its entrance into the Frisches Haff, an inlet of the Baltic, 335 m. N. E. of Berlin, and 75 m. E. N. E. of Dantzic; pop. in 1871, 112,123. The city is subdivided into the Altstadt on the west, the Lobenicht on the east, both lying high, and the Kneiphof, a low island on the Pregel, which is crossed by seven stone bridges and an iron railway bridge. There are also four suburbs. A railway connects Konigsberg with Berlin on the one hand and with St. Petersburg on the other. Its port is Pillau, 20 m. TV., on the Baltic, at the entrance of the Frisches Half. There is a considerable trade, mostly with Great Britain; the exports are bread-stuffs, flax, hemp, oil seeds, bones, timber, etc. ; the imports, colonial produce, iron, coal, cotton, and raw sugars. The chief manufactures are textile fabrics, soap, leather, and starch. Sugar and silver refining, brewing, and distilling are carried on. Much amber was formerly found here, but the production has fallen off. The sturgeon fishery is important. The entrances and clearances in 1871 amounted to 3,276 vessels of 563,046 tons. The navigation of the river averages an annual entrance and clearance of 8,900 vessels. The city has 21 churches, a synagogue, an exchange, a city hall, a theatre, two theological seminaries, three gymnasia, schools of all branches of fine arts, science, industry, and commerce, six hospitals, deaf and dumb and blind asylums, and many other charitable institutions. The most imposing public building is the cathedral, a Gothic structure, in which the religious service of the Reformed church was introduced in 1523. In a porch outside of the cathedral rest the remains of Kant, who was a native of Konigsberg. The Schloss, or palace, now used for government offices, was once the residence of the grand masters of the Teutonic order, by whom the city was founded in 1255-'7, and also of the electors of Brandenburg. The university, founded in 1544 by Duke Albert, and hence called the Albertine university, was in a prosperous condition in the 16th century, when the attendance of students, now only 600, was nearly 2,000. Since the castle and city libraries were placed in the university, it has a library of 220,000 volumes, numerous manuscripts, and valuable collections of incunabula and engravings. It also contains five clinical schools, a botanic garden, and a celebrated observatory, which was under the direction of Bessel until his death in 1846, and contains one of the finest meridian globes in the world, prepared by Reichenbach. 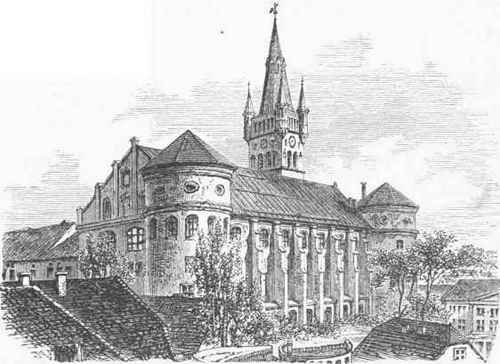 The first rector of the university was Georg Sabinus, the son-in-law of Melanchthon. It became celebrated as the place where the philosophy of Kant was first propounded. Besides Kant, the names of Hamann, Hippel, Herder, Fiehte, Herbart, and Jacobi are associated with the institution. The new university buildings were completed in 18G2. Konigsberg, which had been fortified by detached forts since 1843, has now been made one of the strongest fortresses of Prussia.